Get back to the future. Tom Lix of Cleveland Whiskey is the Jules Verne of American Spirits. He has invented his Amazing High-Pressure Whiskey Time Machine — sending Bourbon back to the future to age faster than previously possible. Their American Whiskey is aged in new charred oak barrels for a little while — then things get crazy. The barrel is cut into pieces and placed WITH the Whiskey in a special pressurization chamber that makes the wood “breath” the spirit in and out, mimicking the natural process that normally takes years. What you end up with is a Bourbon that tastes much older than it is. Cleveland Whiskey was founded in 2014 and sold its first finished bottles just a few months later. To mix things up, Cleveland Distillery has created their “Underground” line of five exotic wood finishes. These woods have unique flavour profiles, but are crappy for making barrels. But with their unique pressure ageing process that is no longer an issue. 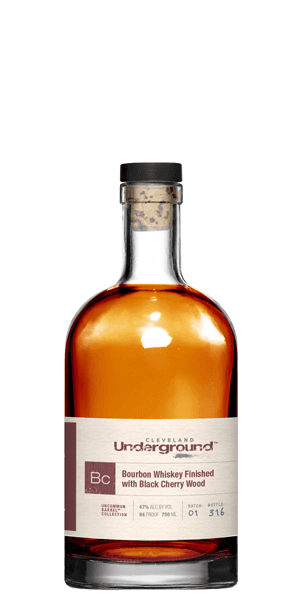 Cleveland Underground Black Cherry Finish Bourbon is their signature Bourbon, pressure-aged with large chunks of black cherry wood to add a light tartness and a sweetly-spiced nuance at 45% ABV. What does Cleveland Underground Black Cherry Finish Bourbon taste like? The Flavor Spiral™ shows the most common flavors that you'll taste in Cleveland Underground Black Cherry Finish Bourbon and gives you a chance to have a taste of it before actually tasting it. Light, with almost tender sweetness and notes of baking spices and raisin. Was very excited to try this cherry wood blend, ended up disappointed. First taste, it gives off a flavor of cardboard. Now, let the ice cube/s melt and of course the flavor profile changes for the better. The best it tasted was after it poured and sat in the fridge overnight and the ice cube completely melted. Unfortunately, I won't be trying this again. Loved the black cherry notes! Not usually a Bourbon drinker, prefer Scotch, but THIS ONE really stands out for me! Really, Really like it! My new DRINK! Very smooth and sweet with a nice subtle finish. Smooth and almost sweet but not really I can't explain it but this is a very interesting bourbon.